integrating tai chi into daily life. Enjoyable and energizing, it makes tai chi accessible to people of all ages and abilities. 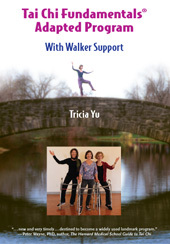 This adaptable, safe, holistic exercise program is ideal for lifelong well being. - Basic Moves: 11-minute series of exercises that serve as building blocks for training tai chi movement skills and energetics. - Tai Chi Fundamentals® Short Form: 4-minute flowing sequence simplified from the original Tai Chi Fundamentals® Form. - Mind/Body Skills Training: Fosters attention and focus, a calm observant state of mind, awareness of posture and breathing, and physical relaxation.